There are many different ways for students to cheat both in and out of the classroom. As technology continues to advance, so do the opportunities for academic dishonesty. With a simple Google search, a person can find information on printing a personalized “cheat-sheet” water bottle label, ordering wireless ear buds for discreet communication, getting writing pens with hidden cameras and much more. There are even cell phone apps created specifically to help students cheat. K-State is no exception to the problem. Each year, dozens (if not hundreds) of cases of academic dishonesty are reported to the university’s Honor and Integrity System. During the 2013-14 school year between the months of August and July, there were 197 cases of Honor Code violations, according to the annual Honor and Integrity System Report. These violations included, but were not limited to, unauthorized collaboration and plagiarism, which are clear violations of the University’s Honor Code. 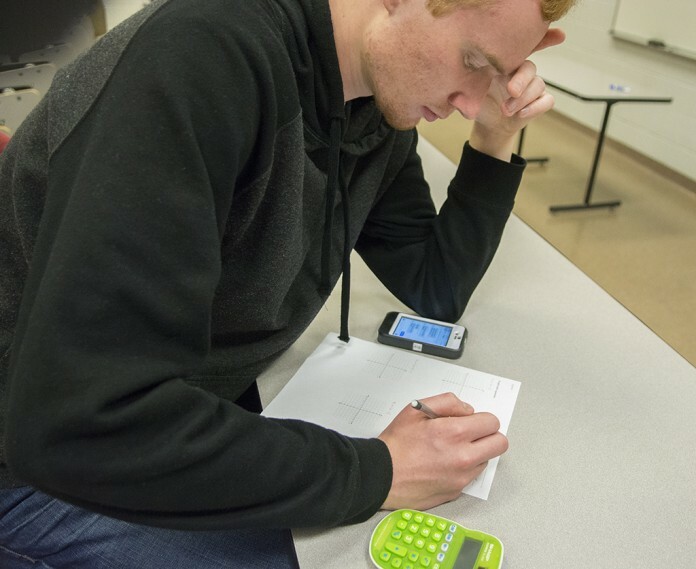 Cheating can be done without the assistance of electronic devices, and yet as technology is becoming commonplace in the classroom, it is becoming easier for students to tap into the world of academic dishonesty. This can produce conflict for teachers when it comes to allowing students to use technological devices during class. Instructors at K-State have varying polices on the use of technology during classroom time. Some allow it for note taking and in-class interaction while others ban it completely. Earl Brown, assistant professor in modern languages, allows students to use electronics during class time to assist with learning. 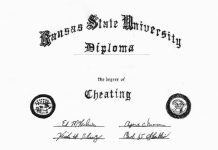 Earl said he does not allow electronics during examinations or tests, but has yet to have a case of academic dishonesty during his time at K-State. Continued technological advances have opened new opportunities for academic learning and now, more so than ever, both teachers and students have a plethora of resources at the tip of their fingers. Questions have been raised, however, as to whether students should be allowed to use technology in the classroom at all, given its potential for academic dishonesty. Technology in the classroom is something that many students have come to not only use with frequency, but also expect. Miranda Phipps, senior in English, said using a laptop in classes was something she just assumed was allowed everywhere. “I had a class where it was not allowed and when I got to college, I kind of had this thought that every class would allow you to use your laptop because it’s very stereotypical, so it was interesting,” Phipps said. Phipps said she can see pros and cons to using electronics in the classroom, but thinks it is beneficial overall. Kristina Brown, instructor of Spanish, teaches Spanish 301 this semester and does not allow electronics in her class due to a policy in place for lower-level Spanish courses. On the other hand, she said she personally is not completely against using it in a classroom. “I can definitely see some benefits to using electronics during class time, but then again drawbacks as well,” Kristina said. Kristina said electronics give students an option to take the easy route and, when coupled with stress, that option can seem very worthwhile. Kristina said she takes measures to prevent cheating, such as spacing out desks, asking students to put all material in a zipped backpack, and circulating the room during an exam. Cheating is not restricted solely to the on-campus classroom and many students have found ways to cheat at online classes as well. Collaborating with other students and looking up answers online during examinations are some popular ways students cheat their way through an online test. Due to its technological nature, and without the presence of a teacher to monitor, some assume that cheating is more prominent in online learning. Donald Kurtz, associate professor of sociology, anthropology and social work, said that is not always the case. Kurtz said that when it comes to grades, he does have more F’s in his online classes. He said this most likely indicates, if anything, a lack of cheating. “I think there’s this idea that because there’s not this direct one-on-one connection there’s more cheating, but who are all the students that just want to line up and take classes for someone else?” Kurtz said. Kurtz said there are ways to discourage cheating in online classes, such as using randomized test questions and answers. Kurtz said there is also an option to put a proxy on IP addresses so that online tests can only be taken within a specific area. Additionally, he also used timed tests in the past as well as varying test formats. Kurtz said he has settled on open-book, open-notes exams for his online classes, which he said he believes is beneficial to students. Kurtz said his biggest concern with online cheating is students working in groups to complete exams or tests, which is one of his only restrictions on students. Kurtz said he has caught students cheating during online exams and has addressed the issue, but does not build his classes around the prevention of cheating. “There are some tools you can use to catch that sort of thing, but on the flip side I also think you design your class under the idea that students are mostly honest, and I design my policies to target the group and not so stringent that I’m targeting the one person that might cheat,” Kurtz said. In 1999, the university implemented the Honor and Integrity System. Upon enrolling, students are understood to have agreed upon the university pledge, which applies to all course-work, assignments, and examinations done by students. Violations of the honor pledge can be reported to the director of Honor and Integrity System by filling out a violation report form, which can be found online. According to University Honor and Integrity System documents, teachers have two options when filing an Honor Pledge Violation report. Teachers may choose to conduct their own investigation and set forth an academic sanction, or a teacher may turn the case directly over for investigation and adjudication by the Honor and Integrity System. If a teacher turns a case over for investigation, they are then allowed to recommend an academic sanction. Alleged violators are able to contest the accusation. Sanctions for a first time Honor Code violator can range from simply a written warning to an XF on a student’s transcript. An F signifies a failing grade on a course and an X means it was due to academic dishonesty. In some cases, the X may be removed if a violator successfully completes the development and integrity course, a course taught through the university that can serve as an educational sanction. As of March 26, there have been 104 reported violations of academic dishonesty during the current school year beginning in August 2014.